240-Unit Established Townhome Condominium Community Selects Association Management Group (AMG) to Manage Its Homeowners Association (HOA) | Company Newsroom of Association Management Group, Inc.
April 12, 2016	(Press Release) - Association Management Group, one of the Carolinas' largest professional homeowner association managers with five offices in North and South Carolina, was recently selected to manage Bramblegate Association, Inc. on Bramblegate Road, conveniently just off Guilford College Road, in Greensboro. 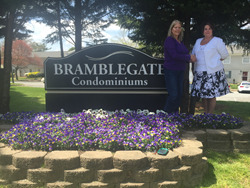 AMG will provide professional governance support to the 240-unit townhome condominium community, one of the oldest in Guilford County, incorporated in 1974. AMG services include working with the volunteer board, assisting with contract negotiation and budgeting, managing maintenance issues and enhancing community communications. According to Community Manager Dayla Maddox, AMG won the business based on their team approach to management. "We are delighted to have the Bramblegate Association as a new addition to our family here at AMG. With our talented and tenacious team with decades of experience in property management, and an equally skilled set of vendors and partners in various fields, we plan to provide this community with the excellence and dedication it deserves." Bramblegate Association President Natalie Pipersky stated the community's decision to sign on with AMG was based on experience. "AMG seemed very competent, business-like and knowledgeable," she said. "And they have been in business for quite some time." AMG founder and President Paul Mengert believes Bramblegate will appreciate the company's proven track record. "AMG is an industry leader because we take our mission of making it easy for customers to succeed seriously," he said. "We supply our client communities with the experienced assistance they need to easily handle the day-to-day work as well as the challenges. We look forward to supporting Bramblegate Condominiums with the best minds, the best attitudes and the best professional solutions to help them sustain the healthy, attractive and harmonious community that residents love."